I want to take you through a Guided Mind Sweep. The mind sweep is a technique gleaned from David Allen in his book Getting Things Done. In the Getting Things Done methodology, or more commonly known as GTD, there are five phases of the GTD method. The first is to collect things, get them out of your head, get them off of your desk, get them out of your notes, and then process them, organize them in your system, continuously review them, and take action. In the first phase, the Collect phase, the mind sweep is one of the most powerful tools you can use to get things out of your head. One of David's most famous quotes is, "Your mind is for having ideas, not holding them." The mind sweep is a tool that is going to help you get relief and get things out of your head. It's going to give you a sense of calm and control. You can download our Mind Sweep tool. It's a simple PDF tool, where you can use this to capture things as we go through this guided mind sweep. So, you may want to pause the video, download the PDF. Print it out. You may want to print a couple extra pages before we get into the mind sweep. This is going to take anywhere from 5 to 30 minutes. You may have so many things in your head and in your systems that you need more than 30 minutes. But in just five minutes, you're going to get a sense of control and calm from getting these things out of your head. Download and print out our Mind Sweep tool before we get started. Couple ground rules before we do get started is, don't try to overthink things. Just simply write them down, get them out of your head. You can throw this away when we're done. This is just a simple exercise for getting things out of your head so you can see what it feels like to start to get control in that first step of the GTD methodology. What's currently on your mind? Whatever's coming to your thoughts, just write those down. You may want to pause the video while you're just capturing those until you're at a stopping point. Now, look at your calendar. If you have your phone handy or your planner, just take a quick look. What has happened in the last two weeks? Is there anything that you need to follow up on? What's on your calendar in the next two weeks? Is there anything you need to do to get ready for some critical deliverables or critical meetings? Just write those down. You may want to pause the video while you review the last two weeks and the next two weeks. Are there any conversations or meetings that you've had recently that may not have been on your calendar? Did you run into someone? Did you have a conversation, and there was some follow-up that needs to happen out of that? Let's take a look beyond the next couple weeks. Do you have any vacation coming up? Any vacation planned in the next couple weeks or couple months? Is there anything you need to do to get ready for that vacation? Is there anything you need to delegate before that vacation? And while we're on the topic of vacation, is anything with your family that you need to do? Any birthdays? Anything with school? I'm sure still thinking. Pause the video. Just capture everything related to the family, friends. Let's take a look at your office. If we were to walk around your office right now, what would you see? If you're physically in your office, then you can do this. Walk around your office. Are there papers around with unfinished things that you need to capture? Is there any equipment that needs maintenance? Any supplies you need to buy? If you're not physically in your office, just walk through it in your mind. Coming to the door, look around. Is there things written on on your whiteboard? Capture those things. We could do the same thing for your home. If you're at home, this is a great time to do this exercise. Walk around your home. Are there things that need to be fixed? Do you need to call someone for service? Walk around the yard and look for anything that needs to be done... Maybe from a seasonal perspective, if you're getting ready for the spring, or maybe it's coming into the summer, or even fall? Are there any seasonal items you need to be thinking about? And if you have any other locations where you spend a good amount of time, maybe you have two offices or you spend time in multiple locations, just go through those areas as well in your mind's eye. So let's step up to the 30,000 foot view. Is there anything that's going on in your life that's longer range planning? Looking to get a degree, do you need to register to go back to school? Are there any certifications that you need to work towards getting? Any longer-term initiatives at work? Any personal goals? Any financial goals? As these come to your mind, just write them down. Think about all the projects that you currently have going on at work and at home. What are some things that needed to be done to move those forward? What's the next action item on one of your projects? If you've got a project list. This will be a great time to pull that out. Start just reviewing those. If you've got a notebook where you're keeping notes, flip through that. One last time, think about any other open loops you may have. Anything do this week or next week? Any new client that you need to reach out to? Anyone you've been meaning to to connect with? Any new special events? Any fun that you need to write down. Any concerts coming up? Any special events, and the family may have planned? Or, maybe it's a celebration at work? Any other relationships that you need to foster? Personal relationships, professional relationships? Anything else, just anything else come to mind. This was a quick guided mind sweep. Hopefully by doing this exercise, you've filled out both sheets of paper, maybe even more. By getting this information out of your head, what we refer to as open loops, and starting to capture them somewhere that you potentially will start to trust is the first step of that GTD process. At this point, you probably have an immense sense of relief. You may even feel a little more relaxed. You may also feel a little bit of anxiousness or overwhelm, because wow it's a really long list and that you were holding on to a lot of information in your head. But that's that first step of the GTD methodology. Getting those items out of your head and into a system so you can then organize them, review them, and take action. So, hope you found this guided mind sweep very useful. Let’s face it, if you’re as busy as we suspect you are, you don’t want to make the investment of an audiobook, a Kindle edition, or a paperback if you’re not sure you are going to read it. Even if you do intend to read a book, the insights there may be valuable to you now… so why wait to benefit? A brilliant concept for boiling down business and development publications into videos of roughly twelve minutes apiece, readitfor.me gives you the essence of a book so that you maximize a quarter of an hour by learning something new without even having to pick the book up. Then later, if you have the chance to do so, you’re conceptually one step ahead. We love readitfor.me so much, we have partnered with them to offer a selection of three curated books each month to our readers. Enjoy our gift to you, a free subscription to readitfor.me and consume the essence of that next essential read in less than twelve minutes. Two simple questions that can change the course of your next conversation. How were you taught to treat others? Think back, how did your parents teach you to treat one another? How about your teachers? How did your coaches teach you to treat your teammates? And, how did your family members teach you to treat one another? As I've asked this question thousands of times, I get two simple answers. The first, is respect. The second, is the Golden Rule. That Golden Rule, do unto others as you would have them do unto you, is one of the primary rules that we are wired to think about how to treat others. As I ask those that give the answer of respect, I get back the same answer. Respect is defined from your own prospective. The Golden Rule and respect, are a way that we see the world not as it is, but as we are. This is our emotional filter, this is how we are wired. What I want to do today is introduce you to something different. We are different. There is communication in behavioral diversity with each and every one of us. The work that we do here at Institute Success, we see that over 80% of the folks you interact with on a daily basis have a different natural style than you do. That means only 20% have a style that is similar to you. Not exactly the same, but similar. As you see your daily interactions, there's potential conflict with four out of five people. Where, you are processing through your emotional filter, how you think someone might need to treat you the way you want to be treated. We introduce the Golden Questions™, a different way of framing this problem. The Golden Questions™ are intended to replace the Golden Rule. That first question is, who am I communicating with? Instead of using the default and treating that individual you are communicating with the way we want to be treated. We ask ourself, "Who are they? Are they like me, or are they different than me?" Remember, four out of five times they're often someone different than your natural style. Then, comes in that second question. How can I adapt to be successful with that person? If I know who they are and they're different than me, then I need to adapt. My communication style, my behavior, to match their preferred style because they're wired the same way we were wired, which is with that Golden Rule. These are two really powerful questions. I'd like to share a story with how this played out for me just on a daily basis, so very simple example that's got to start out with understanding who I am. This is my DISC style. I'm a moderate D, a low I, a high S, and a high C. I'm what you would call an SC style, I'm more introverted, kind of a blend of people in task. But, I'm more in my head, more introverted, more quiet, more reflective. I'm also very habitual. One thing I do every day, is I go to Starbucks. I hate waiting in line, so as a good introvert, I'm going to pull out the app. Don't have to interact with anyone, simply place my order, my breakfast sandwich, my coffee. Voila, in three to seven minutes it'll be ready. Well, about two years ago my typical daily routine changed. My son had changed schools, and so I started going to a different Starbucks. But as usual, I dropped him off at the bus, pulled out my phone, placed my order. Three to seven minutes, drove to that new Starbucks, walked in the door, and there I was greeted with this lovely customer service person sitting at the register, and my ticket still sitting on the printer. My coffee wasn't ready, my sandwich wasn't ready. It was eight minutes in, and that three to seven minutes had long gone by. There I was, not too dissimilar from this picture. I think I had, my arms were probably crossed. Not really happy, standing at the end of the bar where you pick up the mobile orders. Staring down the lady at the cash register, and staring down that ticket. Not a happy person. Well, this went on for a couple of days. It didn't really change much. But then I was like, "What about the Golden Rule? No, that's not working. So, let me try these Golden Questions™." I asked myself, "Who am I communicating with?" Now, I didn't have a DISC assessment on this individual, but I could pick up behavioral clues, as I was trained using the DISC assessment. That, based on the fact that she was highly talkative, she was talking with the other customers, distracted, not grabbing my ticket and dealing with it, she was less task oriented and more people oriented. I had a sense of what style she was. As we know now, she was a high I, high S style. I decided to adapt my communication with this person. Read a name tag, her name was Kathleen. I started to employ techniques to be successful with Kathleen, right? She's a high I, high S style. I wanted to make sure I made eye contact. I needed to smile, no, there's no crossing my arms. I needed to say hello when I walked in. Actually, even better, I needed to say, "Hi Kathleen." I needed to start up a conversation and find a common connection. This is what Kathleen valued. I started doing that, and after a couple of days things changed. Because, no longer did Kathleen see me as just another ticket, I was now a person in her mind 'cause she's people oriented. I had a name, it was Andy. When that ticket rolled off the next time she's like, "Oh, there's Andy. Andy's coming back in." When I would walk in and my sandwich wouldn't be ready, she would say, "Hey Andy, your sandwich is in the oven." Things changed dramatically over those next couple days, next couple weeks. To the point where I could still walk into that Starbucks today, and I'd get a good morning from Kathleen, and I'd say good morning, and we acknowledge one another. It's a win/win for both of us. I employed that set of Golden Questions™ to have success in that interaction with Kathleen. I didn't have the luxury of her DISC assessment, so it's if you're working with folks that you're not able to pick up on their styles yet, it's a great tool to understand their communication preferences. One of the sections in the DISC assessment is ways to effectively communicate with one another, and things to avoid when communicating with an individual. So, some really powerful tools that you can leverage to your benefit to employ theGolden Questions™ even more effectively. So, wonderful success with my interactions with Kathleen. What I'd like to leave you with today is .... How could the Golden Questions™ impact your next conversation? Here's to success in your next conversation. Institute Success™ is officially launched, and so is our new company website. InstituteSuccess.com is a destination where you’ll find resources, assessments, and coaching and training services to engage your world so you can be more successful than you ever thought possible. One of the most exciting features we offer is a free Talk with a Coach session with one of our certified career, leadership or business coaches. Communication Workshops help you learn to move conversations from frustrating dead ends to successful outcomes. Classes are available in person and virtual, and we’ll tailor-make workshops for your team. Available to individuals and teams, DISC, DISC Plus and ADVanced Insights Assessments help you to gain insight into your natural inclinations and talents and how they can help you achieve your goals. Career services meet you where you are to help you get where you want to be, from a review of your resume and LinkedIn profile to career acceleration packages and an in-depth briefing of your DISC and Values assessments with one of our certified coaches. You’ll also find a wealth of information in our Library: carefully curated articles, books, quotes, videos and blogs, as well as a sign-up for daily inspirational quotes and our monthly newsletter. This is just the tip of the iceberg—there’s so much more to see! Check out this video for a tour of our site. Sometimes the one thing that we should be doing is masked by negative habits. How do we determine the right thing to focus on and create the ability to habituate this behavior? I began by reviewing some articles and books at the top of my reading and re-reading list. I gravitated to Gary Keller’s recent business book, The One Thing, which stood out and grabbed my attention. Thumbing through it, I found myself reflecting on the premise. At the onset of Chapter One, Gary repainted a scene from the movie City Slickers, where Curly and Mitch connected over a conversation. Curly: Do you know what the secret of life is? Mitch: No. What? Curly: One thing. Just one thing. You stick to that and everything else don’t mean sh*t.
Mitch: That’s great, but what’s the “one thing”? Curly: That’s what you’ve got to figure out. Through that illustration Gary brings readers through a discovery of the power of questions and defines a critical question that helps you identify your One Thing. He calls this the Focusing Question, and it simply asks, “What’s the ONE Thing I can do such that by doing it everything else will be easier or unnecessary?” The beauty of this question is its simplicity, while the power of the question lies within how it’s answered. Why? Because when answered it changes your perception and view point. How could I have prevented this fire drill? What else am I not doing? Who else am I disappointing? Realizing all these questions were not getting me anywhere, I stopped and asked myself the Focusing Question. After searching for an answer, one finally comes to me. The One Thing that I can do such that by doing it everything else will become easier or unnecessary. At some point, we all suffer from this feeling of being overwhelmed and over- committed. The challenge is that the real solution to reducing this dread is rarely how we naturally attack the problem. Our natural inclination is to work faster, harder, and longer. However, the more things we complete, the more things that seem to get added to the list, and we enter the vicious cycle of un-sustainable over-commitment. So instead of fueling the fire, the answer, My Answer, is to create a Habit of Workflow Mastery. With clarity on my One Thing, I intend use this article to distill how to take new single actions which require mastery and tranform them into a habit and eventually mastery. My single action is workflow; yours may be something different. The first step to creating the Habit of Workflow Mastery is to gain, or regain in my case, an understanding of GTD workflow before I begin to adopt this workflow. This workflow requires one to stop and get all these “things” that are garnering their time and attention into a well formed list. And not just any old list, but one that is a system that you can trust to collect, process, organize, review and take action on. Before I set off on my 5th attempt at GTD and buy yet another copy of “Getting Things Done”, I pause to ponder the fact that I have yet to successfully adopt the method for longer than a few days or weeks. Why am I such a fan but still unable to adopt the method? If I am being honest, it’s because I never truly committed to the GTD workflow beyond the initial pass through the five phases. During previous attempts to adopt GTD, I would collect everything that was currently in my mind, in my notes, in my email, and anywhere else I could find it. There was such a rush of energy each time I completed the process. As I got everything out of my mind, notes, and email, and into a trusted system as part of the initial pass through the five workflow phases, I would feel as though the proverbial monkey was off of my back. The next day, however, is where it all slowly started falling apart. Another request would come in, or I’d make a verbal commitment to a colleague as I had always done. Slowly but surely I would build up a set of commitments that were not collected in my trusted system. Within a matter of days I would end up back to the state in which I started. I was never able to establish the habit of GTD because I failed to collect my commitments on a regular basis. The Collect Phase is what ultimately leads to the creation of a truly trusted system. Even though I went though the workflow once and felt exhilarated, I neglected to repeat the workflow on a consistent and continual basis. Simply doing a process once does not mean you are the master of it. True mastery starts with commitment that is followed up with the discipline, practice, and patience that ultimately form habits. Something will “bug” you until you’ve clarified your intention about it (outcome), decided how to move on it (next action), and put reminders of the outcome and action in places your mind trusts that you’ll see as often as you need to and at the right time. Those are also the behaviors that ensure things get done— defining what “done” means, deciding what “doing” looks like, and installing the results of that thinking into a structure that most easily promotes implementation. What stands out in this description of both the need and process of GTD is “installing the results of that thinking into a structure.” This suggests that this way of thinking should be built into a system such that it becomes more natural and automatic. I am that system and the only way to make that thinking natural and automatic is to create a habit. I need to create the habit of the GTD Workflow that will ultimately lead me on a path of Workflow Mastery. 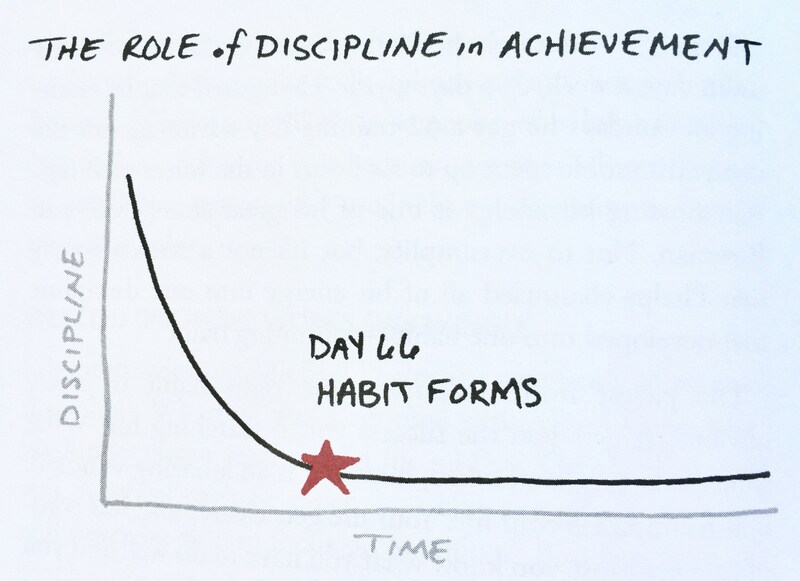 Habit creation is an interesting endeavor. The beauty of habit creation is that we are creatures of habit, and once we have a habit in place our behavior goes on autopilot. The challenge comes in creating habits that are opposite of existing habits, such as new diets, new exercise routines, or new work processes. Large amounts of research in animals has shown that neural pathways begin to harden after repeating the same behavior for 21 days. These studies uncovered that habit formation is a re-wiring of the brain on a fundamental level. It is moving new behaviors from a place of conscious deliberate thought to unconscious and automatic behaviors. The rule of thumb that it takes 21 days to build a habit has become common in self help and how-to books. This has led to the rise of hundreds of book titles from Teach Yourself Java in 21 Days to Learn to Play Guitar in 21 Days. Additional studies at the University College of London showed that in humans the point at which a new habit or behavior becomes automatic ranges from 18 to 254 days, with the average being about 66 days (as shown in Figure 1 [Kel13]). Easier habits tend to become automatic more quickly. Habits will take both time and discipline. The discipline required to adopt is inversely proportional to the length of time the habit has been practiced or exercised. This requires commitment to both start and maintain the discipline continually. The point at which the habit is adopted can only be determined in hindsight, so discipline must be continued past the day of habit formation. Unfortunately 21 days or 66 days is no guarantee especially with fundamental habit changes as these are not often the easier habits. Furthermore, one must adopt one habit at a time, and build on them over time. Attempting to build multiple habits will decrease or eliminate the changes of formation. Just saying one wants to adopt a new habit isn’t enough. Just saying it and intending to practice isn’t enough. Two other key ingredients are necessary to increase the likelihood of habit formation: accountability and time. Accountability comes in many forms. Verbal commitment is one form of accountability but weak. As we hold verbal commitments only in our head, they are subject to conflicts and loss. We must move beyond verbal commitments to stronger commitments. Writing down a commitment strengthens the accountability and greatly increases the chances of success. Individuals' with written goals are 39.5% more likely to result in success [Kel13]. Reflecting on those commitments or goals is another great way to strength and reinforce accountability. Individuals with written goals and weekly accountability increase their chances for success to 76.7% [Kel13]. Allowing time to practice or adopt the new habit is crucial. Any new habit will take some amount of time. Beyond adoption, time to reflect on the new habits and form the weekly accountability needs to be scheduled. This ensures both practice and reflection occur on a consistent basis and avoids a reversion back to day one of habit formation. Let the experiment begin! It is about a month until I need to complete my next article, which will explore moving from habits to mastery. That is a bit more than the minimal 18-21 days to begin developing my new habit of collection. In the mean time, I will instill the behavior of practicing the GTD workflow by committing to goal, scheduling time each day to practice, and reflecting weekly on my commitment to increase the chances of adoption. After this month, this habit should be be closer to automatic or quickly becoming an ingrained behavior. In the next article in this series, I will look at how I continue to move my workflow from habit to mastery. We’ll also look more powerfully at how to develop the continual Habit of Mastery on your One Thing(s). [All02] Allen, David. Getting Things Done: The Art of Stress-Free Productivity. Penguin Books, 2002. [All04] Allen, David. Ready for Anything: 52 Productivity Principles for Getting Things Done. Penguin Books, 2004. [Kel13] Keller, Gary & Papasan, Jay. The ONE Thing: The Surprisingly Simple Truth Behind Extraordinary Results. Bard Press, 2013. [She04] Sheahan, Peter. Flip: How to Turn Everything You Know on Its Head— and Succeed Beyond Your Wildest Imaginings. William Morrow Paperbacks, 2009.